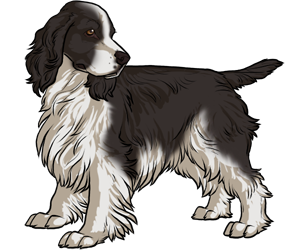 The English Springer was considered to be the perfect companion for hunters during the European Renaissance. The English Springer and Cocker Spaniels were born in the same litter but the smaller dogs were considered Cockers. The Springer Spaniel is better known in North America because of the field trials it participated in. Recognized as its own breed in 1902. They can hunt, track, retrieve, point, guard, compete in obedience and agility and perform tricks. Was officially recognized by the AKC in 1910.